The PXLim knife is part of the fabled PXL series of larger than usual folding knives which carry the emblem EDC which means Every Day Carry. As with others in the family, the PXLim has a stainless steel adjustable blade which is made from Fallkniven’s fabled 3G laminated powder steel with a hardness of HRC62 that results in an edge that is very well retained and a sharpness that is quite second to none. 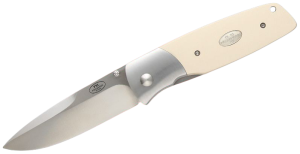 The PXLim knife comes with an ivory micarta handle which simulates ivory but which is not the actual material since Fallkniven is keen on the conservation of such a rare material. It feels beautifully and handles extremely well with a shine that gives an added lustre to proceedings. You may rest assured that even if your hands are bloody or full of grease, the ivory micarta handle will still allow you the maximum grip. However it is important to keep the handle and the blade in tip top shape if you want the best out of your knife and that means washing the handle with a cloth mildly soaked in soapy water and keeping the blade sharpened and on its toes with one of Fallkniven’s excellent sharpening tools. The PXLim also comes with a safe and extremely strong liner bladelock which allows you to open and close the blade with a minor effort if you are right handed and also if you use your left hand. The strong, removable clip assures safe, fast and comfortable access to the knife. Since the PXLim is a precision instrument and is very sharp, you should obviously take care while using it. The PXLim also comes with a Black cordura sheath that ensures maximum protection all around and a safe storage.